BitDefender Internet Security 2010 is comprehensive Internet security software that offerr protection against malware, spyware, virus, Trojan, spam, hackers without slowing down the PCs. BitDefender Internet Security 2010 comes with user-friendly interface with designed for expert or novices that interface adapt to the chosen profile and provide quick access to the main security functionality. In addition, the new BitDefender 2010 has improved Parental Control, Intrusion Detection, and In-Product Technical Support. Furthermore, it also features a cutting-edge security system and Active Virus Control that constantly monitors all the processes on PC, 24/7, and blocking any malicious behavior before it can cause any damage. BitDefender Internet Security 2010 able scans PC in half the time needed by earlier versions, while using fewer resources. BitDefender Internet Security 2010 normally cost $49.95 to purchase for three licenses. As part of promotional offer from BitDefender, now everybody can get a free 90 days BitDefender Internet Security 2010 with full commercial working version, with no restriction nor locked features. As promotion offer is expire on December 15, 2009 so hurry up. Then click on “Descarca acum” (top of the page) to download bitdefender_isecurity.exe file. Once downloading the file, run it to install BitDefender Internet Security 2010. Grab fast as offer expires December 15, 2009. Note: If you see the installation in Romanian language, then copy the downloaded “bdis.msi” file from C:\Windows\Temp to another folder and again run that installation file (bdis.msi). 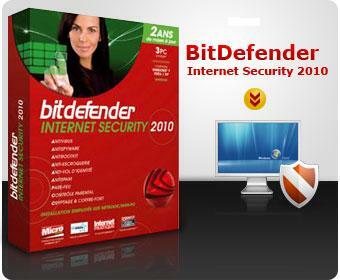 BitDefender Internet Security 2010 supports Windows 2000, Windows XP, Windows Vista (32&64 bit), and Windows 7. Also check out more free anti-virus offers.